A development application has been submitted for a new 20 storey residential tower located at 60 High Street, Toowong. 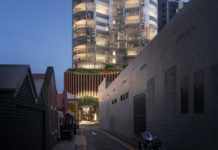 Proposed by Nan Xin Brisbane Toowong Ltd Pty, the development comprises of three ground floor tenancies, three podium levels, three internal communal open space areas, a rooftop terrace and recreation area and 171 residential apartments in total. Designed by Conrad Gargett architects, the project aims to creates shared spaces from the ground to roof for enjoyment by residents, visitors and the public. Vehicles are moved to the rear of the site to allow High St and Ebor St to function as a safe, pedestrian-friendly public space with retail and food premises, street seating and planting. Shared outdoor rooms are set to punctuate the south-western facade with outdoor dining and relaxation opportunities and connection to landscape with planting, trees and green walls. According to the architects, the extent and position of glazing and shading is negotiated to maximise views and shading in the summer, to create a cool apartment with excellent cross-ventilation. The choice of materials, context-appropriate building design, leafy shared spaces and open ground floor proposes to create an enduring architectural product for Toowong and its residents. 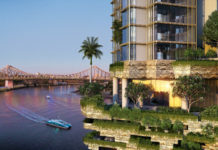 According to the development application, the project has adopted the design elements advocated in the Brisbane City Council, New World City Design Guide: Buildings that Breathe. Spaced vertically up the building, 3 double-height outdoor rooms are proposed, which would be able to be shared by all occupants. The space includes a patio and BBQ space for communal get-togethers, encased by trees, shrubs and green walls. Floating above this space is a verandah for group meals, yoga sessions and movie screenings, connecting the levels internally, and connecting outside to the inside. The development application number for this project is A005076003.